There’s no doubt that the ’80s and ’90s had some amazing arcade racing games. From Out Run to Top Gear, there’s that certain style that’s hard to find today. That’s where Horizon Chase Turbo comes in, a classic arcade racer made by classic arcade racing fans. Just by looking at the game you can tell the inspirations for this game, but is there more here than just simply replicating the arcade racer style? The gameplay is as simple as it needs to be. Your only button inputs are to accelerate, brake, and use your limited amount of boosts. You have a fuel gauge that you must manage throughout the race by collecting gas cans that are placed in certain areas on the track. There are also coins scattered across the track that you can collect while racing, which net you an added score bonus as well as working as currency to unlock new courses, modes, and cars. Each vehicle has its own set of stats, which will detail things like top speed and fuel economy. There are also upgrade races you can play that will add stat boosts to all of your cars. While the gameplay is simple, there is a nice challenge to how the game is set up. With each race consisting of 20 racers, you will need a lot of skill to maneuver around your competition at high speeds without getting into any fender benders. The racetracks usually consist of many sharp corners, and with no drift button, there are only 2 ways of tackling them. Either you hit your breaks and slowly turn the corner, or you push on through and hope you don’t just wipe out. You are also given a set amount of boosts for each race, which can make or break your race depending on where you decide to use them. The game heavily relies on your skills, but it also relies on your stats as well. When choosing your car you’ll have to decide what you want to prioritize more: your speed, acceleration, handling, fuel, or nitro. Having a nice balance between skills and stats is the key to victory in this game. There’s a ton of content to unlock in this game as you progress. There are 32 different cars you can win by playing the several modes this game has to offer. World Tour is the main mode, where you can travel across the globe and compete in races, which will unlock more courses and rides for you to use. Tournament mode is where you compete in a set selection of tracks between 3 difficulty modes. You can unlock special cars in this mode, and any stat boosts you’ve obtained in World Tour can also be used in this mode. Endurance mode is a continuous race between a set number of tracks ranging from 12 to 109 – clear some serious playtime for this one! Lastly is a brand new mode launching on the Nintendo Switch version called Playground mode. Here you compete against players across the world in weekly challenge races with their own unique twists from the normal races in the game. These include things like time attack challenges with infinite nitrous to mirrored tracks with new weather effects. This adds to the replay factor and is sure to get people to keep coming back every week. Horizon Chase Turbo pulls no punches in its nostalgia overload, and the art style is very reflective of that. The game goes for a very simplistic style that reflects the ’80s/’90s arcade racers like Sega’s Out Run, but with a modern touch to it. Despite the simplistic graphics, the game still looks beautiful and the courses tend to have some amazing looking backgrounds and weather effects. The only issue I have is that there isn’t much going on in the tracks themselves. Most arcade racers from the ’80s and ’90s made the worlds feel lively with people standing by watching the race or having fun things going on within the racetracks. While the backgrounds can look amazing, the tracks feel very bland after a while. This isn’t necessarily a bad thing, especially if you love the racing style of the game, but they could have done more with some of the courses to really give it that arcade racing quality. Besides the graphics, the game boasts several references to the ’80s and ’90s can be found in the game via the car models and quotes your driver may occasionally say. However, it’s the awesome soundtrack composed by Barry Leitch that really seals the deal. He’s the man behind several classic racers, such as Top Gear and Rush. There are quite a few musical numbers here and they’re all great and work as a great backdrop to racing across the country. The entire package comes together so well to evoke the classic racers that so many of us enjoyed in our youth. They don’t make a lot of racers like this any more. 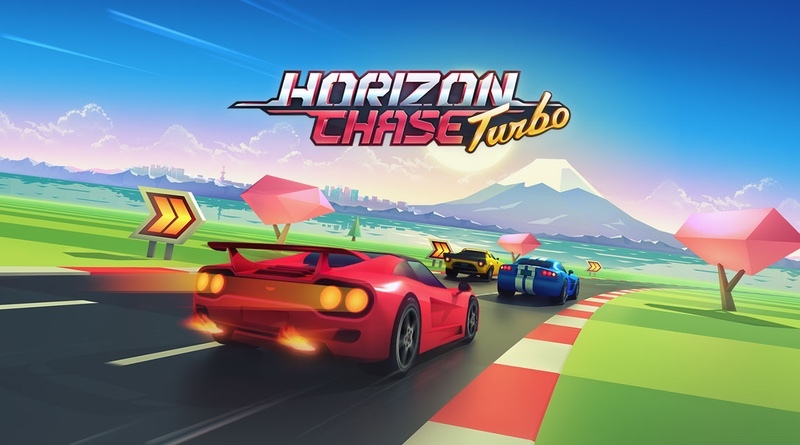 Most developers are so focused on making realistic car simulators, and while there’s definitely a market for that type of game, it’s great to see the pure joy and fun of the arcade racer live on in Horizon Chase Turbo. This one’s great to play solo or competitive and is perfect for short sessions on the go or longer plays on the TV. Horizon Chase Turbo is everything you could ask for in a modern take on the classic arcade racing genre. The gameplay is simple, there are several modes and cars to unlock, and the online leaderboard events will keep you coming back to this game again and again. If you’ve been craving a classic arcade racer, then this is just the game for you.